MS® CA syringe filters are purpose-built with features designed to bring the highest levels of performance and purity to your research. We incorporate a variety of membranes to offer separation and purification solutions for the majority of your laboratory needs. 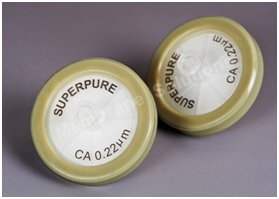 MS® CA Syringe filters are suitable for the filtration of aqueous solutions. Cellulose Acetate combine high flow rates and thermal stability with very low absorption characteristics. Especially 0.22μm pore size CA Membrane excellently suited for sterilization aqueous solutions, buffers, sera and media.